Three Guys From Miami: IN THE NEWS! You may have seen us or heard us on the air! Click on any of the highlighted shows above for more information! 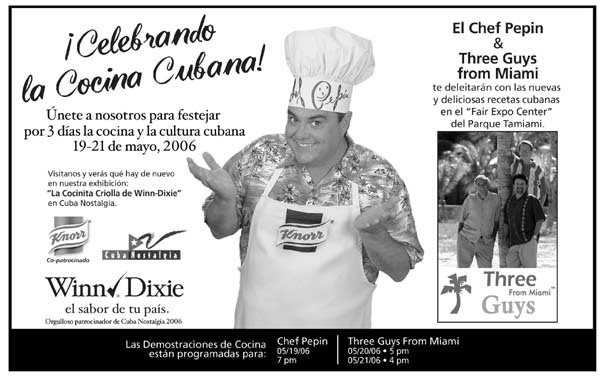 The ‘Three Guys from Miami' autographed copies of their new Cuban entertaining cookbook Saturday in Little Havana. Some fans traveled a long way to meet them. If a weekend book signing in Little Havana is any proof, these three cookbook-writing guys have some loyal followers. ''I came from San Diego to see them,'' said Monica Davila, who was on a six-day vacation to see the Marlins' last game of the season and to meet the authors known as ''The Three Guys From Miami.'' The trio is actually a gringo from Minnesota and two Cuban-Americans living in Miami. Glenn Lindgren, Jorge Castillo and Raul Musibay signed copies of their latest book, Three Guys from Miami Celebrate Cuban: 100 Great Recipes for Cuban Entertaining on Saturday at Sentir Cubano, a Cuban memorabilia store in Little Havana. They were joined by artist Tony Mendoza, who was showcasing his ''Little Havana Comidas'' art and selling prints. 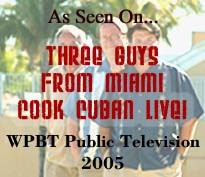 The trio published their first book, Three Guys from Miami Cook Cuban, in 2004. 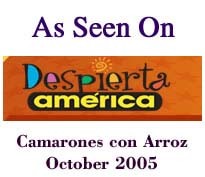 Since then, they have been featured on the Food Network and Travel Channel. For their second book, the cooks steered away from classic Cuban dishes to ones for entertaining, like the rum-and-Coke cake and mango margaritas. Fan Jorge Archillia, a 35-year-old vet technician from Argentina, said he liked how the guys infuse their recipes with other Latin American touches. ''I love Cuban food, and I like their approach to the topic – Cuban but with a touch for Miami,'' said Archillia, who lives in North Miami Beach. Joshua Dixon, whose wife is Cuban, said he appreciated the guys' step-by-step recipes – and the fact that they write in English. Lucille Bigelow recalls the first mojito she was served in Havana. "Our group was escorted to a hotel roof deck with a great view of the old city," says the Deerfield Township woman. "We were served these cocktails with mint in them. "In fact, it was the whole plant, root and with a little dirt for good measure." Bigelow and her fellow tourists, part of a University of Michigan-Flint-sponsored group, got many other chances to discover if the authentic Cuban mojito includes native soil. They were pleased to learn it doesn't. A co-author of "Three Guys from Miami Cook Cuban" says the mojito seems headed down the same road that took the daiquiri to as many variations as there are fruity, sweet ingredients. "I've encountered 'dry' mojitos on the East Coast, which is all wrong" said Glenn Lindgren. "I've seen ginger ale substituted for the soda water and 7-Up. They're being made with mango puree and even flavored syrups. "I had one made with vanilla syrup that was dreadful." For a variation Lindgren would accept, try a banana mojito from "Miami Spice" by Steve Raichlen (Workman, $12.95). Is there a better cuisine to set out to master these days than Cuban? The spices are hot, the drinks are cool and the desserts are sweet. Three Guys from Miami Celebrate Cuban is the second book from Raul Musibay, Glenn Lindgren, and Jorge Castillo. Musibay and Castillo were both born in Cuba while Lindgren came to Miami from Minnesota. Together the three buddies cook, run a Web site and are a source of Cuban cooking tips for professional and amateur chefs in Miami. 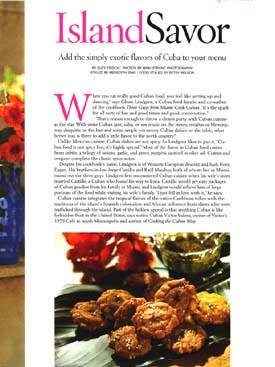 In this new book, subtitled 100 Great Recipes for Cuban Entertaining, they teach readers to party, Cuban style. While the book includes dialogue between the three which is on the silly side, it grew on me. Each recipe includes a conversation about ingredients, origins and why the dish fits into the Cuban style. As for the recipes, they are totally serious. 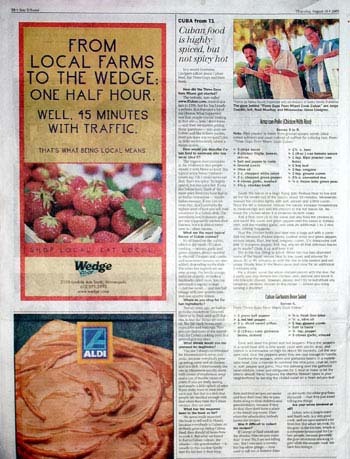 It was difficult to choose only a few to share in the paper. From desserts, to side dishes, to meat and fish entrees to pizzas and cocktails, there's no lack of fresh ideas. The food glossary is also helpful but many of the recipes don't require a trip to a specialty market. That's another thing to celebrate with the Three Guys from Miami. I'll admit these aren't recipes that are on the light-side. They are full-flavored and full-calories. It's no mistake the first chapter is desserts. They are rich including the seasonal Pumpkin Flan with Raisins and a Mango Upside Down Cake. You'll find the clever Rum and Coke Cake recipe shared here. I whipped this up this weekend and it was a big hit with its sweetness and wonderful glaze. But make no mistake, you taste the rum. I'd use a light hand adding it next time. Also, cook the cake on low end of the time suggested. It is dense but I found it to cook quickly. Though the Three Guys said they like to double the glaze recipe, I would cut it in half next time I made it. Though the directions call for spooning it over each slice, I glazed the cake and then spooned more. I still had plenty left over but I liked adding the glaze to soak into the cake. "Three Guys From Miami Celebrate Cuban"
PARTY TIME: You have to like a cookbook that devotes its first chapter to desserts. In fact, there's a lot to like about Three Guys From Miami Celebrate Cuban, an encore from Jorge Castillo, Raúl Musibay and Glenn Lindgren, the trio's Minnesota ringer and presumed driving force (the copyright is in his name). Besides standards like red beans and rice and escabeche, you'll find lesser-known and in some cases original dishes like Cuban deviled eggs (served warm with tomato sauce), Cuban-Chinese roast pork, rice with Vienna sausages, and rum and coke cake. The recipes are clear, the many color photos inviting, the text often illuminating (e.g., the Cuban-Viking connection; who knew?) and the tone infectiously playful. This book could provide the perfect antidote to wintry weather. Everything about it reminds us of summer - the sky blue cover, glossy photographs of tall, chilly cocktails and plates filled with fresh, light fare, with a few hearty stews and soups in between. The authors, known as "Three Guys from Miami," vow that each day is a party; the first chapter is titled "The Cuban Party Tradition." Appropriately, the first section of the book covers desserts - Rum and Coke Cake anyone? Then come the bebidas, or drinks, many made with rum. Primed for a party, we decided to sample from the appetizer section. Bruschetta Cubana is toasted bread smeared with garlic and topped with fresh tomatoes, sweet onion, cumin and garlic. It provided an easy, breezy nibble for an Indian summer soiree. No doubt, we'll be using this book to inject sunshine into our lives in the months to come. Pairing suggestion: A bottle of Bacardi or Matusalem rum; a CD of Cuban music to cook by. Check the authors' Web site, icuban.com, for suggestions. Glenn Lindgren, one of the authors of the hot-selling new Miami Cuban cookbook, "Three Guys From Miami Cook Cuban: 100 Great Miami Cuban recipes with a Touch of Cuban Spice" isn't really from Miami. He grew up in Minneapolis and now lives in Eagan. But he does spend a lot of his free time in Miami, fishing and cooking with his Cuban-born co-authors Raúl Musibay and Jorge Castillo. Their book, published last fall, is already in its third printing, with 15,000 copies. The three are also partners in a popular website, icuban.com, and have been featured on the Food Channel and Travel Channel. They were connected first by marriage. Castillo is married to the sister of Lindgren's wife. Musibay is married to Castillo's sister. Castillo left Cuba in 1980. "He spent about three weeks in Miami and decided 'I am never going to learn English here. I want to be American.' So he went to Iowa," Lindgren said. "His family would send these big care packages, we would open them up and there would be these wonderful Cuban foods, a lot of them needing us to prepare them. That is how we learned to cook Cuban foods." As for Musibay, in his family, the women did the cooking. But he tended to the roasting of pigs, which he learned from his father and father-in-law in Cuba. In a recent interview, Lindgren talked about Cuban food, the Three Guys, and their book. How did the Three Guys from Miami get started? The website, now called icuban.com, started as a lark in 1996. Just for fun I made a website that featured a lot of our photos. What happened was that people started looking at that site – how I don't know – and then we started getting these questions – you guys are Cuban and like to have parties, don't you have any recipes? Little by little, we reluctantly added a recipe or two. How would you describe Cuban food to someone who has never tried it? When you eat really good Cuban food, you feel like getting up and dancing," says Glenn Lindgren, a Cuban food fanatic and co-author of the Miami Cuban cookbook Three Guys from Miami Cook Cuban. "That's the spark for all sorts of fun and good times and good conversation..."
...Unlike Mexican cuisine, Cuban dishes are not spicy. As Lindgren likes to put it, "Cuban food is not spicy hot; it's highly spiced." Most of the flavor in Cuban food comes from sofrito, a trilogy of onions, garlic, and green peppers sautéed in olive oil. Cumin and oregano complete the classic spice notes. "If I had to choose the "spiciest: city in the U.S., based not on the heat of the food but on the sass of the people, I would probably choose Miami. 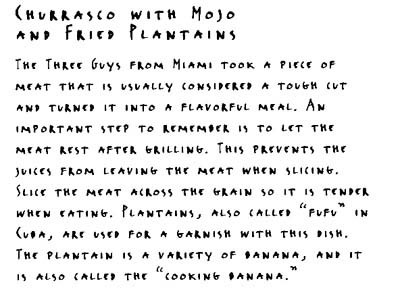 So it comes as no surprise that the Three Guys from Miami have put together a fun and fiery Miami Cuban cookbook. Now, as they explain, though the habanero pepper was named after Havana, it is rarely used in Cuban cooking, and in fact Cuba's most commonly used pepper is very mild. But that doesn't, in this book's case, put out the fire. Three Guys From Miami Cook Cuban offers good food, humor, and a few subtle political twists--true to the country it represents. In addition to really interesting food shots (a half-loaf of bread floating on water), there are photos of folk art from Little Havana, restaurant signs, Cuban architecture, and the Three Guys from Miami with pineapples on their heads. The glossary is better than decent and obviously assembled with care. And the recipes, accompanied by comments from each Guy, offer just as much stimulation as the book's other elements. I like it. Highly recommended." Capping a 20-year love affair with all things Cuban, especially food, this trio will bring any kitchen to life with their recipes and stories. 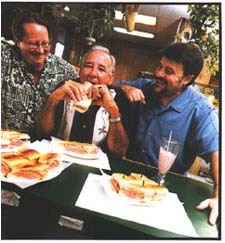 The three brothers-in-law deliver 100+ recipes peppered with culinary and social history." 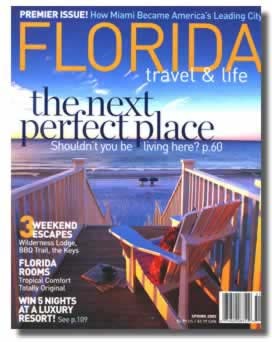 The Three Guys From Miami are featured in a four-page photo spread and article in the March issue of Coastal Living magazine. 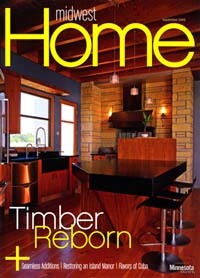 We spent two days in April 2005 in Miami with a crew from the magazine to shoot photos for the feature article. 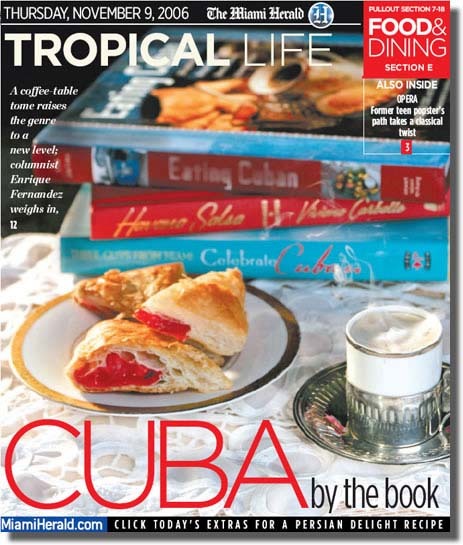 The issue includes a four-page photo spread and three pages of recipes from our Miami Cuban cookbooks. "Dubbed the Three Guys From Miami, these brothers-in-law might not appear to have much in common. "Before I met Jorge Castillo, I only knew of two Cubans: Fidel Castro and Desi Arnaz," says Glenn Lindgren. Glenn grew up in Minneapolis far from hot Havana nights. But once Raúl Musibay and Jorge immigrated to the United States, fate (and women) brought the fellows together. They've been cooking ever since..."
"Whenever we do something for TV, it usually means a lot of work with three guys working hard in the kitchen," Raúl says. "The Coastal Living people came to town, cooked all of our recipes for us, decorated Jorge's house, and provided all of the place settings and tableware. We just had to show up and enjoy the party!" "It was fun to see someone else preparing our recipes for a change," Jorge adds. "They really did a nice job preparing the dishes and styling the plates." "We looked to the Miami masters of fun, good times, and easy-to-do Cuban foods – Raul Musibay, Jorge Castillo, and Glenn Lindgren – to help us with a dinner that will reenergize travel-weary guests. These brothers-in-law call themselves the Three Guys From Miami, and we've adapted recipes from their Miami Cuban cookbook, Three Guys From Miami Cook Cuban, for you to try. The main dish takes you outdoors to grill chicken. Dessert is a very relaxing and potent Rum Cake. As Raul tells it, entertaining company should be "No rush! Laugh and have a good time, do a little salsa [dancing], or whatever it is at your house. Greet everyone with a smile, and be happy." Some good words to set the mood in your home." 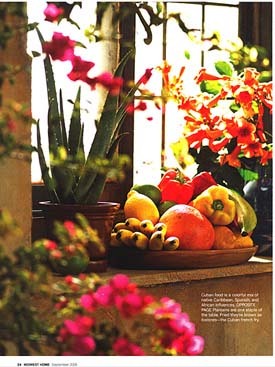 Photo spread copyright 2005, Southern Living Magazine. 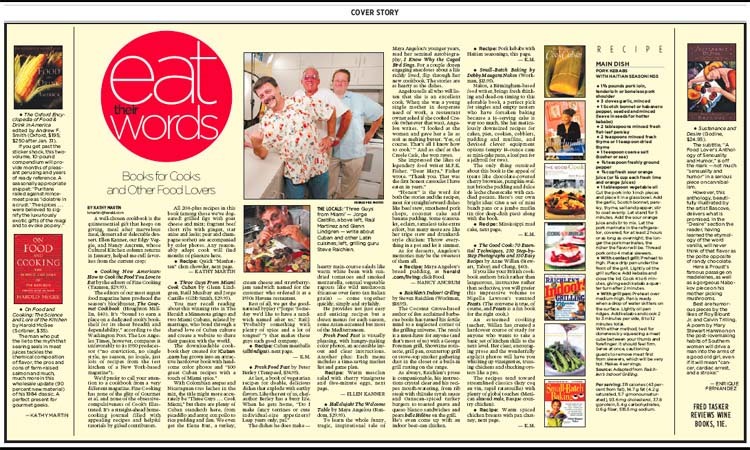 "Now's the perfect time to delve into a cookbook like Three Guys From Miami Cook Cuban. I swear I could almost feel the Miami sunshine beaming down on me as I read through the book. The "Three Guys" are Glenn Lindgren, Raul Musibay and Jorge Castillo. The three are all brothers-in-law who run the popular Web site icuban.com: The Internet Cuban, a site dedicated to Cuban culture. 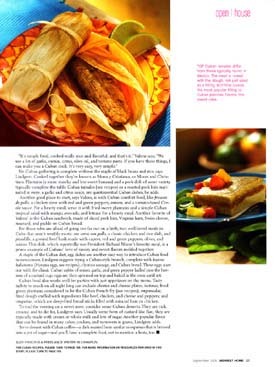 "This is more than just a Miami Cuban cookbook, although it is a very appealing collection of mouthwatering recipes. It's just as much a guide to Cuban culture. Every recipe comes with a "chat" between the three authors. Sometimes it's a bit of information, other times a humorous little interchange between them. 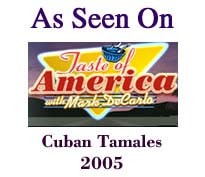 The more than 100 recipes include some longtime Cuban favorites as well as dishes that were created by the Three Guys. Some of the classics have been retooled to make use of the great ingredients available in Miami. 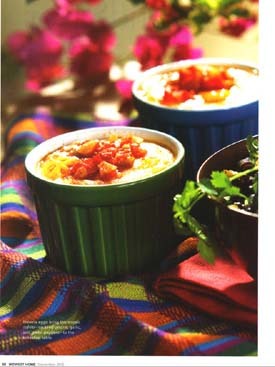 "None of the recipes is particularly difficult, although there are a handful that require multiple steps. The photography is beautiful and inviting, making one ready to hop on a plane to Miami. For most of us that's not possible, so this cookbook is the next best thing." "You may recall reading about this winning trio in The Herald: a Minnesota gringo and two Miami Cubans, related by marriage, who bond through a shared love of Cuban culture and create a website to share their passion with the world. With Colombian arepas and Nicaraguan tres leches in the mix, the title might more accurately be ''Three Guys . . . Cook Miami,'' but there are plenty of Cuban standards here, from picadillo and arroz con pollo to rice pudding and flan. We even get the Elena Ruz, a turkey, cream cheese and strawberry-jam sandwich named for the customer who ordered it at a 1930s Havana restaurant. Best of all, we get the good-natured byplay – Jorge: Someday we'd like to have a sandwich named after us. Raul: Probably something with plenty of spice and a lot of tongue! – that makes these guys such good company." 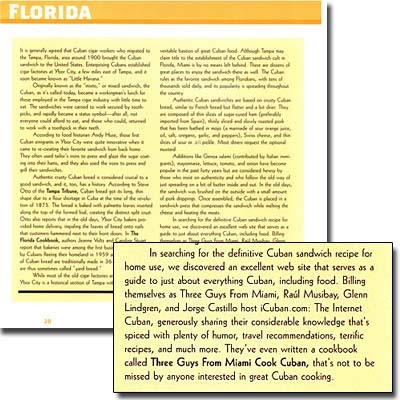 "I mention "Three Guys From Miami Cook Cuban: 100 Great Miami Cuban recipes with a Touch of Miami Spice" by Glenn Lindgren, Raul Musibay and Jorge Castillo because there aren't too many Miami Cuban cookbooks around as of yet, and this one is very accessible. The authors are on the Food Network too. And they even tell you how to make that devastating Cuban coffee." "And what would the holidays be without a surprise under the tree? My choice for the "I want to try something new" cookbook is "Three Guys From Miami Cook Cuban." This is the first cookbook by the Three Guys, none of whom are classically trained but are, as it says in the Introduction, "three guys who share a passion for good food, good conversation and a good party." And guess what? Drink recipes lead the chapters. But you'll also find recipes for the Cuban Sandwich, Papa Rellena (fried stuffed potatoes), Empanadas (with a variety of stuffings) and Paella. 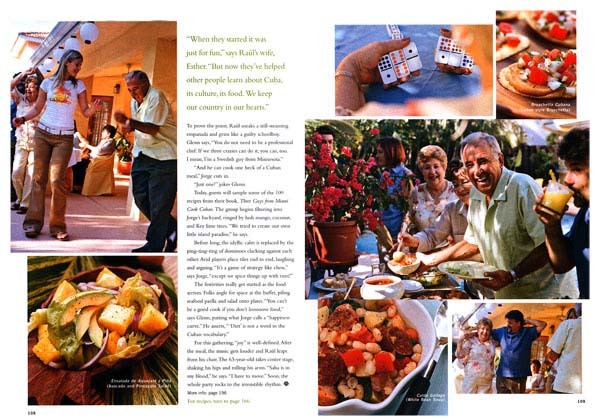 The book is sprinkled with pictures of the guys (Glenn Lindgren, Raul Musibay and Jorge Castillo) and a sort of running (and often funny) commentary on the recipes and Cuban culture." 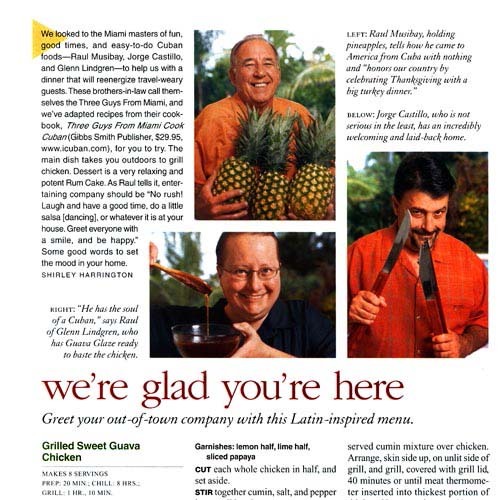 "Three Guys From Miami Cook Cuban: 100 Great Miami Cuban recipes With a Touch of Miami Spice:" Glenn Lindgren, Raul Musibay and Jorge Castillo are the three guys. They're all brothers-in-law. They share a passion for good food, good conversation and a great party. Their Web site has been a hit since it went up. This is their first Miami Cuban cookbook. It won't be their last. The desserts are scrumptious, but rich, rich, rich. These three guys are the kind of zanies that make the world go 'round. Pass the tres leche cake, please. Glenn Lindgren, a 49-year-old gringo from Eagan, is better known as one of the "Three Guys from Miami" who have promoted Cuban culture and dishes through a popular Web site and multiple Food Network appearances. 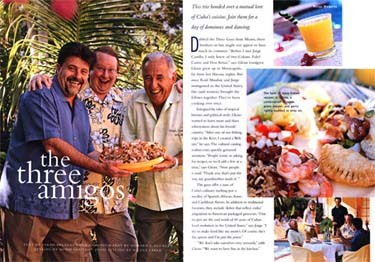 The trio – Lindgren is related by marriage to the other guys, who really do live in Miami – recently published a Miami Cuban cookbook called "Three Guys from Miami Cook Cuban." Who he is: A typical 49-year-old Swedish-American guy and free-lance writer obsessed with Cuban culture. (Actually, he figures he's a mix of Swedish, English, German and French.) "I was a person in search of one identity," Lindgren jokes. In 1996 he created the Web site icuban.com, which offers advice on how to roast a pig, how to party like a Cuban and where to find the best Cuban sandwich in Miami. How he became an honorary Cuban: Lindgren and Jorge Castillo married two sisters from Iowa. The first time the Minnesota man met his future brother-in-law, he listened for hours, enchanted, to Castillo's stories of the homeland he fled. "To me, a Cuban guy was a real novelty. The only Cuban I ever heard of was Fidel Castro or Desi Arnaz." The other guy from Miami, Raul Musibay, married Jorge's sister. Lindgren has never visited the country, primarily because he and his friends do not agree with Castro's Communist government. A heritage of hot dish: Lindgren grew up in a family that didn't stray from Minnesotan cuisine. His mother started off her recipes with the essential cream of mushroom soup. His dad, a picky eater, refused even pizza. But Lindgren didn't share his parents' tastes for bland: When he was about 7, he would insist on boiling hot dogs in his own homemade broth, which included celery and Worcestershire sauce. Should we be expecting to see an all-day pig roast in his neighborhood? "My neighbors keep bugging me to do it." Lindgren has attended friends' pig roasts, dismayed that they ignored his only piece of advice: Save the skin. "It's like a delicacy." His suggested dish: Arroz con pollo, which he says is a more flavorful version of the old Minnesota standby of chicken with rice. "When you taste the Cuban version of it, you'll never go back to the Minnesotan one." This is television, and the smooth cooking you see on the show is not exactly what goes on at a taping. Food is spilled. The camera is not quite quick enough to capture Jorge's dog trick with Spanish sausages. Dozens of takes are required to get a segment right. Raúl goes back to work, leaving Jorge and Glenn to finish the paella. It's almost ready now, a gorgeous yellow rice packed with seafood, the mussel shells sticking out from the plate. ''Like Stonehenge,'' Jorge quips. He sprinkles peas over the yellow rice. Glenn comes after him and adds some more. Then, he and Glenn add lobster shells and red peppers for decoration. ''That is a very lovely paella,'' Florence finally says. And it's a wrap. In Miami, anyhow. 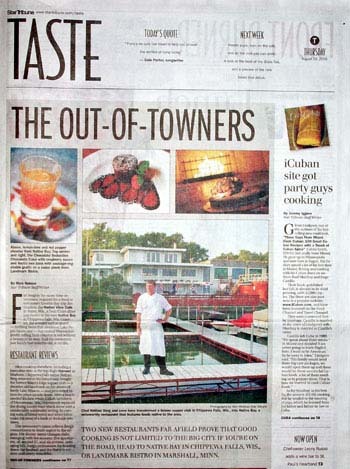 As for Glenn, he now serves paella for Thanksgiving – in Eagan." The Massachusetts Plimoth Plantation, a historical recreation of Plymouth in the time of the early pilgrims, has always been the definitive source on American Thanksgiving history and customs. 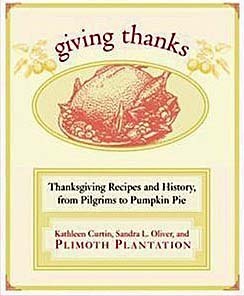 In this new work, which is part historical guidebook and part cookbook, Plimoth Plantation Food Historian Kathleen Curtin and co-author Sandra Oliver have created the definitive work on this quintessential American holiday. The authors joyfully dispel many myths surrounding that first harvest celebration and bring to light many new historical details and anecdotes that really bring that first Thanksgiving to life. The recipes are great, and the authors have even included some ethnic twists on typical Thanksgiving fare. You'll even discover how Miami Cubans have 'Cubanized' the traditional American turkey with black beans and rice. That's right, the Three Guys From Miami have a featured recipe in this book. Giving Thanks: Thanksgiving Recipes and History, from Pilgrims to Pumpkin Pie is a great holiday gift idea. If you're going to the in-laws or a friend's house for Thanksgiving this year, instead of bringing that same old "dish to share," order this book and bring it along. It makes a great gift that will get your hosts and all of the partygoers into the Thanksgiving spirit. And on Thanksgiving, who really needs Aunt Edna's green bean casserole anyway? At our house, there's always PLENTY of food to go around! 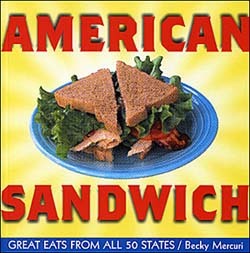 "American Sandwich" brings you specialty sandwiches from all 50 states. And we ask you, who doesn't like a good sandwich? Not only will you soon be stuffing yourself with great sandwiches, you'll also learn a little about the history of the sandwich, the birth of Wonder Bread, and the influence of immigrant flavors on American sandwiches! Becky is an accomplished cook who has gathered recipes throughout the world. With recipes contributed by outstanding American chefs and food writers such as John Thorne, nationally acclaimed food writer and author of Serious Pig and Pot on the Fire (Bahn Mi); Marlene Parrish, food writer for the Pittsburgh Post-Gazette (The Original Devonshire Sandwich); Chuck Taggart, host of the popular website gumbopages.com (Creole Roast Beef Po-Boys); and Three Guys from Miami, authors of Cuban Food with Attitude (Cuban Sandwich). 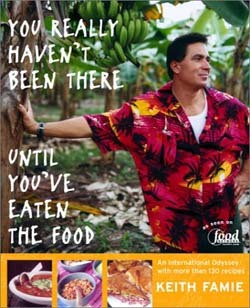 Excerpt from the book, "You Really Haven't Been There Until You've Eaten the Food."